1851, 3¢ Orange Brown, Types I & II, July 1851 Usage Collection, group of 50 covers used during the first month of usage starting with the 2nd day mostly complete through the 31st with some duplicate dates, most are plated with notes concerning varieties, includes: Jul. 2 Vargennes Vt. blue cds with #10 pos. 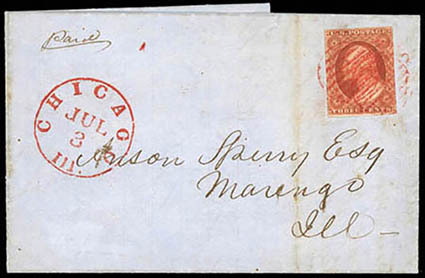 25R1e (faulty), red "Chicago Ill. Jul 3" cds and matching grids tie beautiful four-margins 3¢ #10A pos. 56R1e with deep rich color, red "North Bridgewater Ms. Jul 4" cds with matching grid ties #10A bottom sheet margin single, blue Baltimore Md. Jul 5" cds on #10A to New York and with "Forwarded" straightline and "New-York Jul 6" cds to Boston, red "New-York Jul 8" cds on cover with #10A pos. 84L1e tied by squared grid, red "Boston '6cts' 9 Jul" cds with magenta small Boston "Paid" grids on two singles on cover to Portland Me. (one is stated to be part India paper), and red "U.S. Express Mail N.Y. 'N.York' Jul 11" cds on cover with two #10A singles pos. 71R1e, 85R1e (one having ½ inner frameline) to Boston; some mixed condition, F.-V.F. Scott No. 10/10A Estimate $2,000 - 3,000. A REMARKABLE GROUP OF 3¢ 1851 ISSUE FIRST MONTH USAGES. 1851-57 3¢ Issue, Specialized Collection, small collection balance including #11 o.g. block of four, #26 o.g. block of four, #26 position. 99R11L on cover, 10A var. yellowish orange brown position 21L1E, #10 on part India paper (tiny tear) on stained cover, three #11A covers notated as experimental O.B., #11 position 1R1L corner margin single on cover; #26A pairs on two legal-size covers, #26 & #26A forwarded cover, #26 deep claret on cover with all-over building ad on reverse, 26 var. deep orange brown on cover, etc., interesting group. Scott No. 10//26A Estimate $500 - 750. Autographs, Documents, Engravings etc., balances of Alexander estate including signatures, original Newspapers with interesting engraved illustrations, clippings and printed photos on various subjects, etc., noted includes Edmund Burke signature, 1795 Robert Morris signed North American Land Company share certificate (signature affected by acid erosion), 1796 Sam Adams, 1778 James Warren ALS, Thomas H. Benton Senator free franks (6), 1856 Frank Leslie's newspaper with St. Louis steamboat fire, 1858 The New York Herald announcing the new overland mails via St. Louis in 23 days, group of General Land Office certificates signed by Presidential Secretaries, engravings of battles, etc., interesting balance. Bank Check and Document Group, of well over 100 items; mostly bankchecks with early 1860's from western states including First Issue + Nevada combination revenue usages, California state revenue use, Wells, Fargo & Co. and San Francisco items, mining related, etc. ; worth review. Bank Note Issue Covers, 1870-88, box of over 315 Banknote covers from an estate lot, includes mostly 2¢ brown or 3¢ green issues with a variety of towns including Illinois, some Territorials and Western, RPOs, cancels including some fancy, auxiliary markings; mixed condition, an interesting lot with some potential. 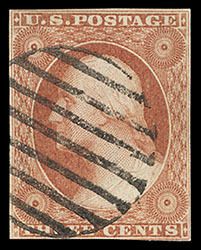 Bank Note Issue Covers, 1870-88, group of 31 covers, some noted include three faulty #150 phantom rate usages to France, #158 (2) NYFM geometric use to Germany, #160 on cover to Germany, #161 to Brazil, #161 to India, #188 to Amoy, China, some advertising, etc. 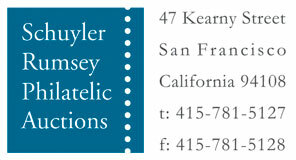 ; some mixed condition. Better Cover Balance, 1800s-1900s, better cover balance of 120 covers and cards including #1 on cover from Baltimore, #2 on cover from Philadelphia, #14 "Paid" cancel from Dixfield Me. 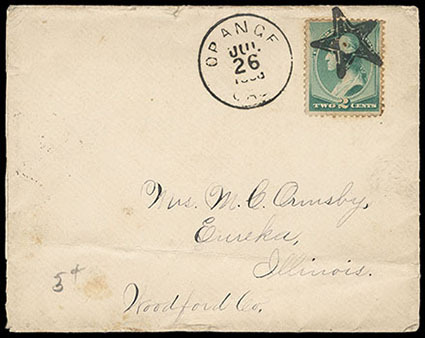 to Illinoistown Cal., #65 and #68 pairs on New York registered cover, #68 pair and #78 on faulty San Francisco Cal registered cover to London, nice group of Wells Fargo imprint covers, a Pacific Union Express cover, #75, 68 on Catskill N.Y. cover to France, etc. ; mixed condition. Boston - Canada Postal History, 1848-1861, group of 11 mostly stampless covers including 1848 Halifax Paid use to New York with Boston cds and retaliatory "29" cent due handstamp; 1856 "U.s. Express Mail, St. John, Sep 4" cds and matching "10" due handstamp to Providence R.I.; and 1861 Boston use with #35 to Montreal; some flaws. 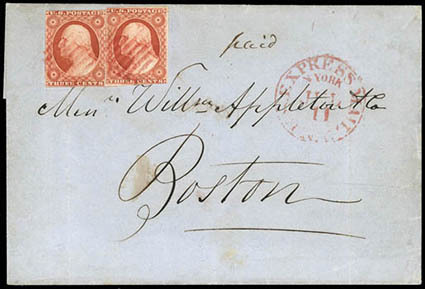 Boston Circular and Local Mail, group of 29 covers including #9 with large Boston "Paid" grid; #9 tied by "Boston Paid" rimless datestamp; couple #73 uses marked due; #73 on Rev. Cahlres Cleveland Missionary annual report; #73 to New Brunswick; various stampless uses with various postmarks, etc. Boston Postal History, 1783-1850s, group of 23 covers including 1783 "Boston" small straightline in olive to Philadelphia; 1783 "Boston" straightline in red (latest known use); 1784 "Boston" straightline in red (EKU); 1850 "Boston, 5 Cts., 21 Mar" integral-rate cds with red crayon "10" overwritten; etc. ; some faults.